The entire compound of the Kep Malibu Bungalows in Cambodia is surrounded by a stunning tropical garden situated between the lush jungle mountains and the sea. Our rooms are spacious and furnished in a brand new Khmer (Cambodia) interior style. 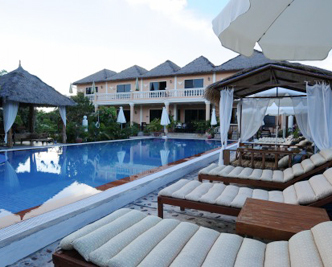 You will find all amenities you need to have a great and quiet stay in Kep. You may choose between fan or air-con, a room or a bungalow. You will find a mini-bar, TV, hot water, Wi-Fi in your room and our great swimming pool with kids’ pool to enjoy your time with us. You can be sure that the discreet staff will do their best to ensure you have a wonderful experience at the Kep Malibu Bungalows.